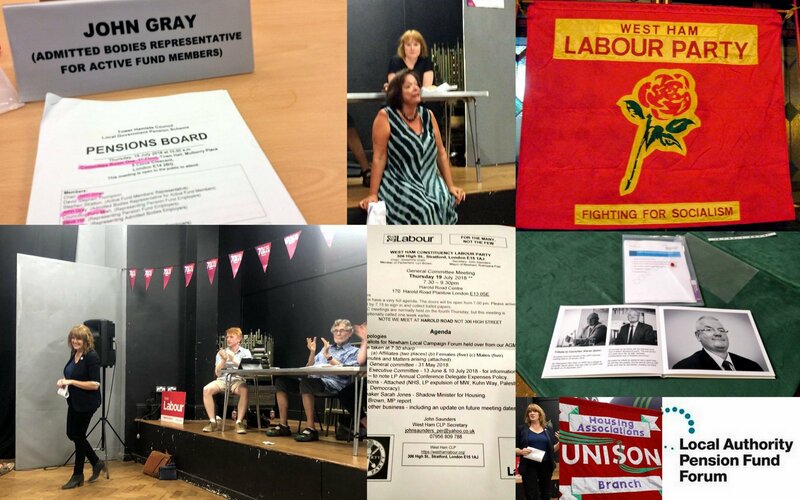 Belated report on a busy Labour movement day last Thursday 19 July. I started the day with a quarterly meeting of the London Borough Tower Hamlets Pension Board as an UNISON appointed representative. The £billion plus fund is doing well and we are planning to try and safeguard very significant financial improvements against any possible future stock market crash. Afterwards I went to the AGM of the Local Government Pension Fund Forum (LAPFF) in Westminster with my Newham hat. I was late due to the Tower Hamlet clash but appreciated the touching tribute at the meeting to the former forum Chair, Cllr Kieran Quinn, who died unexpectedly late last year. Kieran was a proper working class socialist who had a traditional grassroots trade union background but was also an effective Council leader, a tolerant and decent man who wanted to bring about change for the better. He is missed. After LAPFF I went to my UNISON Housing Association Branch in Holloway to speak to staff and sign stuff as branch secretary. A member of our small team is now also a London Labour Councillor and Deputy Cabinet member for housing! In the evening there was the General Committee meeting of West Ham Labour Party. We had Shadow Housing minister, Sarah Jones MP as our guest speaker. Sarah gave a great speech and Q&A. She reported on the really welcome change in public opinion polls towards housing issues and that Labour policy is now 12% ahead of the tories (like the NHS). Our West Ham MP, Lyn Brown, also joined in with the Q&A. Afterwards a few of us retreated to the nearby garden of the historic Black Lion pub to rehydrate after a very long and hot day.